Looking for a recharge deal, well, here is a chance where you can save upto 30%. With Helpchat you can get a cashback of upto 30% on your mobile recharge or bill payments. Helpchat is a user friendly app which you can use to get all your mobile recharge, bill payment, travel bookings, and other services done from your smartphone. Explore various cashback offers with Helpchat and save your money only. Visit here to download app. Make your mobile recharge/bill payment. 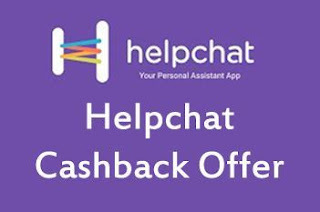 You will get cashback on your Helpchat wallet. Maximum cashback amount is upto Rs.30 only. Applicable for single user for one time only. Not valid for Airtel Users. Download Helpchat now and get all your bookings and payments done instantly!!! Experience latest range of beauty products of Spawake by getting free samples to feel the product quality. You just need to signup with Spawake by giving your details and you can get free beauty samples and beauty pouch from Spawake. Enhance your beauty with sophisticated and skin friendly products from Spawake that will surely fall in love with your skin. So, register now and get your samples delivered at your doorstep!! Click on Signup to get registered. You will get a confirmation on your registered mail id for delivery of free samples. Try these samples and feel the difference in your skin only with Spawake!! !